Brown Clee Hill lies 5 miles north of its sister Titterstone Clee Hill. Its highest peak is Abdon Burf at 540 metres above sea level (1,772 feet), the highest point in Shropshire and the highest point south of the Penines. A toposcope situated at the summit of the Brown Clee points out all the local landmarks and more distant peaks, some of which are over 50 miles away. 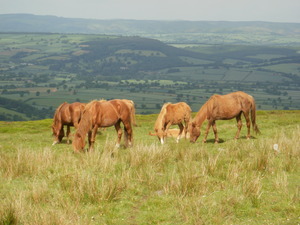 Much of the Brown Clee is private land with the eastern side owned by the Burwaton Estate and the western side is owned by various private landowners and the parish of Clee St. Margaret. The common land features the remains of where an Iron Age hill fort once stood, now called Nordy Bank. Air traffic control radar masts can be seen on the summit of the hill which build up a picture of all the aircraft within a 100 mile radius.